What’s more adorable and charming than this little flower truck we saw in our neighborhood in Nashville every day last week? Absolutely nothing, I’d say. I mean, really. It’s just lovely. Make the weekend lovely, too! 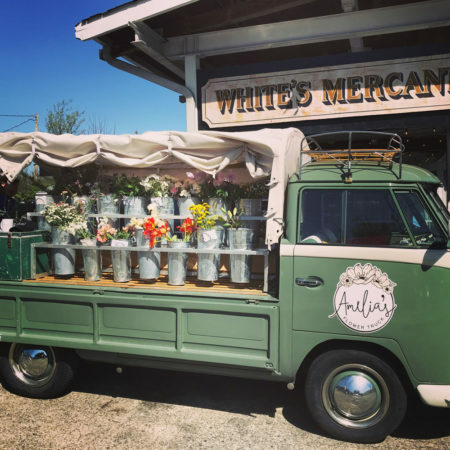 I would definitely be seduced into buying a lot of flowers if I saw that truck every day. It is very charming and clever as well. That would be my dream job! Love it! Nashville is definitely on my bucket list. I used to love the ice cream truck, but I think I would love the flower truck even more! Could be an excellent retirement job! 🙂 Have a wonderful weekend Carole and Dale! It would be lovely to see that truck every day! Happy weekend! I just saw that flower truck in a magazine I was reading yesterday!! LOVE – what a treat to see that every day! Have a great weekend! So lovely, so charming, so vintage and FUN! Love this!